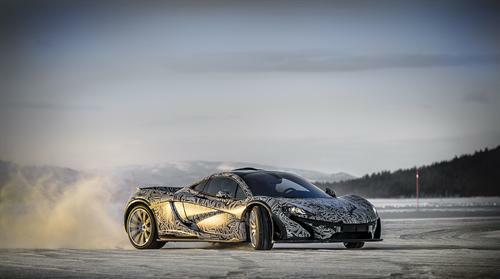 Extreme durability testing of the McLaren P1 supercar takes it to the Arctic Circle where it contributes to global warming by seriously heating up the ice. Watch video! As the McLaren P1 supercar nears production delivery, this year's first lucky owners (all 375 of them) will know that the powerful race-inspired sports car is ready for anything thanks to extreme testing by the McLaren Team. Caught on video, the McLaren P1 was out in the Arctic Circle heating up the ice on a frozen lake on its way to being the feature vehicle at the upcoming Goodwood Festival of Speed. The durability testing took place in northern Sweden, where the P1 was driven hard in some of the toughest conditions on the planet. This is just one of several harsh testing environments the XP prototypes for the McLaren P1 have been subjected to. They've done burnouts in the desert, laid rubber in the salt air, growled impressively around race tracks from Bahrain to Italy, and even appeared in the rough-and-tumble urban traffic scene in the United States. All of this will culminate in the production McLaren P1 to begin entering driveways (and racetracks) this summer. A public demonstration of the official production P1 will happen this summer at the Goodwood Festival of Speed, kicking off the sales event for this powerful, mid-engined supercar. Having been thoroughly tested, the 3.8-liter twin-turbo V8 with its unstoppable 916 PS will be the pinnacle of fifty years of McLaren racing and street design. Has The Plug In Hybrid Broken Into The Super Car Space?